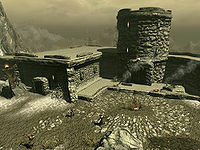 Helgen Keep is a keep used to escape Helgen in the aftermath of the dragon attack. There is a single interior zone to the keep: Helgen Keep. During Unbound, you must escape a dragon attack on the town of Helgen by making your way through the keep and its subterranean caves. After Helgen is abandoned, the town and keep become inhabited by bandits. There are two entrances to the keep, one enters the barracks and the other enters the base of the tower. There is a small difference depending on who you followed into the keep. If you followed Hadvar into the barracks there will be two living Stormcloak soldiers (a male and a female) to the right of the entry from the barracks, and the corpse of Gunjar by the table to the right. The male Stormcloak is equipped with an iron battleaxe and the female has an iron mace and a hide shield; they both wear a Stormcloak cuirass, fur boots, and fur gauntlets. Gunjar has an iron war axe, and wears the same clothes minus the gauntlets. if you follow Ralof the two living Stormcloaks will be replaced by an Imperial soldier and an Imperial captain who rush in from the barracks. The captain carries the Helgen Keep key, needed for a locked gate, and is equipped with an Imperial sword and an iron dagger. She wears a set of heavy Imperial armor, including boots and bracers, and she wears an Imperial officer's helmet. The soldier is equipped with the same weapons, but wears studded Imperial light armor and standard light Imperial boots, bracers, and helmet. The barracks are the easternmost section of the keep. There are four beds by the eastern wall and two dining sections by the western wall. There are two chests by the beds, one is empty and the other holds an Imperial light helmet and some gold. In the northwest corner of the room there is a long table with two chairs, and two sets of shelves. On the table are four gold coins and a copy of Mixed Unit Tactics. The southwest part of the room holds two round small tables—one with one chair and the other with two—two weapon racks, a set of shelves, and the warden's chest. Each weapon rack holds an iron sword, and the chest contains another iron sword, Imperial light armor, Imperial light boots, and a Helgen Keep key. There are two bottles of wine on the set of shelves, a bottle of standard wine and a bottle of Alto wine. There is a pull chain to the right of the corridor that activates a wooden gate to the corridor, and another again to the right that opens the gate to the tower. There is a locked gate to the west leading further into the keep. Through the gate is a cart with two cabbages. To the right is a bench with two sacks to the side of it. To the left is a set of stairs winding down further into the tower. After following the corridor until it becomes a dead-end, there is a door to the left leading to a kitchen. There are two soldiers in here. Hanging from the center pillar are two garlic braids and two leaves of dried elves ear. Hanging in front of the fireplace is a rabbit and a pheasant. On the other side of the center pillar is a small round table with a bottle of Alto wine. Opposite the entrance is a large dining table with two chairs. Around the table are three sets of shelves. Among the utensils on the table is a slice of bread and a bottle of Alto wine. On the left-hand shelves is a potion of minor magicka and a salt pile. On the right-hand shelves is a potion of minor healing and a bottle of wine. Through the connecting archway is a storage area. There is a barrel to the left that contains five potions, three of minor healing, one of minor magicka, and one of minor stamina. There are three sacks underneath the overhanging shelf, and another on the other side of the steps up to that shelf. There is a table to the right with a salt pile and a potion of minor healing. Above that hang two more rabbits. Just in front of the table is a basket with four rock warbler eggs. The door by your companion leads to a corridor going down further into the keep. The next room is a torture room. The Torturer and Torturer's Assistant can be found here in combat with two Stormcloak soldiers. Against the far wall are three novice-locked cells. The side ones are empty and the middle one contains a dead mage, who carries 25 gold pieces, two potions of minor magicka, a novice hood, and novice robes. Alongside him in the cell are four gold pieces, another potion of minor magicka and a copy of the Spell Tome: Sparks. By the second of the center pillars is a small table with a knapsack, an iron dagger, and a copy of The Book of the Dragonborn. The knapsack contains four lockpicks and a potion of minor healing. In the northeast corner of the room is the torturers cell. It contains a weapon rack and a long L-shaped shelf. There is an iron mace hanging on the rack, an iron shield lying beside it, and a copy of Brief History of the Empire, v2 under the shelf by the door. The exit to the room is in the northwest corner, and along the corridor are four prison cells—two on each side. The first on the right is open and empty, as is the second on the left. The first on the left is novice-locked but empty, and the second on the right is novice-locked and contains minor loot—a lootable skeleton and a coin purse. The corridor leads to another torture chamber, though this one is in considerably worse condition, having massive cobwebs in the corners and along the edges. There are two hanging cells to the left, one with a skeleton, the other with a dead Stormcloak soldier. There are another two hanging cells to the right of the entrance, but only one is occupied with a skeleton. There is a third skeleton in-between these two, by two disused hanging cells on the ground. The way forward is through the broken wall and into the natural caves that have been utilized by the Legion as a hidden entrance to Helgen. The first room is guarded by five soldiers, one across the mini-bridge, two in the sunken middle area, and two archers on the far side of the room. The archers are equipped with long bows and also stand over an oil slick, which can be ignited using the spell Flames. After that there is an upturned wooden bridge blocking the way. There is a lever just before it to the right to lower it. Once the bridge has been lowered and crossed it will collapse under some falling rocks. A tunnel is revealed and it leads to a small stream. On the opposite bank is a skeleton, and beside that is a coin purse and a potion of minor healing. The stream leads back to the same room that the normal route was taking; it joins with another stream and flows through another tunnel. The room is empty of any loot. A short distance along the next tunnel it turns right as the stream flows under some rocks. The remains of a skeleton can be seen on a ledge along with a coin purse. The tunnel shows signs of what is in the next room, frostbite spiders. There are three spiders around the room and two larger spiders descend from holes in the ceiling as you enter the room. There are two web sacs around the area where the spiders are, and a dessicated corpse hanging to the right. There are a total of seven egg sacs around the room containing spiders eggs. On a ledge to the left of the entrance is an iron mace by the remnants of a corpse. There is a tunnel to the east that leads back to the stream which has re-emerged from the rocks. There is a lit brazier across the stream on a ledge. By it is a potion of health and an iron dagger. Back on the path there is a cart with three bottles of Alto wine and a coin purse, and on the ground behind it, an iron helmet and a bottle of Black-Briar Mead. In the gloom to the south is a uniquely weak bear. There is nothing else of interest to find. The exit is along a winding path to the southeast. There are a number of minor differences once the bandits take over. Any loot missed before will still be there as the area does not respawn. Kitchen: two bandits sitting at the big table. Torture room: it has been redesigned as a bar, with the torturer's cell acting as the bar itself. A bandit occupies the cell and another patrols the next corridor. On the shelf in the cell there is now an iron dagger, two lockpicks, a copy of Brief History of the Empire, v1, two coin purses, a random potion, six bottles of ale, and a copy of the Archery skill book The Black Arrow, v2. Caves: in the first room after the torture rooms are three bandits, one of whom is a bandit chief. The chief stands in the middle of the cave, near a chest, while the other two patrol the far walkway. The bandits have replaced the collapsed bridge with a permanent walkway, and another bandit sits on it. Finally, there is a frostbite spider near where the unique bear is. The keep will be occupied by rival forces to whomever you followed into the keep, with the exception of the troops in the Torture room (they will always be the same with only the hostility transferred from one group to the other). If you chose Ralof the troops will be Imperial Legion, if you followed Hadvar they will be Stormcloak soldiers. Though the Keep has a technical minimum level of 6, scripts prevent this being applied during Unbound. Instead most soldiers are, at a maximum, level 2, and most creatures are level 1. The minimum level does apply to the bandits that take over afterwards. When returning to Helgen Keep after completing Unbound, despite Alduin being gone from the area, dragon roars can still be heard while inside the keep. This page was last modified on 16 January 2019, at 01:31.